A depleted Kirkintilloch Rob Roy side went down 2-0 to Kilwinning Rangers in their final Premiership match of the year Saturday. 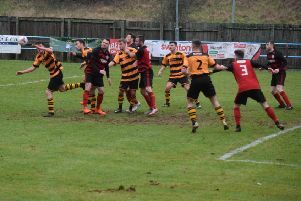 The defeat brought to an end Rob Roy’s seven-match unbeaten league run came to an end as the home side ran out comfortable winners. The depleted Roy squad included two trialists and the first chance fell in the third minute to new right back Fabio Capuano when he saw his shot crash off the Kilwinning bar. The Buffs responded in the 10th minute and Ryan Nisbet’s net bound shot was blocked by Graeme Ramage. This was followed up by a Bryan Boylan effort that came back off the bar. In a Rabs attack Jordan Currie-McLean had a great shot that went past the home goal before Carlo Monti’s effort was taken easily by the Roy’s trialist keeper Craig Gordon. Lee Gallacher’s corner kick was scrambled clear by the Buffs’ defence for another corner, from which Michael Daly headed over the bar. However it was at the other end that the opener came in the 40th minute. Daly failed to clear his lines out on the right hand side and the resulting cross found Boylan in space in the box and he hammered the ball past Gordon to give the Buffs the lead. Rabs replied with a Connor Hughes effort that was blocked for a corner but the home side retained their lead as the teams went in at the interval. The second half was only six minutes old when Rangers increased their lead. And again it was poor defending that was the cause of the goal as Capuano’s slip allowed Nisbet plenty of space to slot the ball past Gordon. The Roy responded and came more in to the contest when Joe Slattery’s powerful shot went over Adam Strain’s bar. Gordon was called into action on several occasions and showed a strong pair of hands as he dealt with the Buffs’ attacks. However as the half progressed the Rabs enjoyed more possession but without looking likely to open their account. With ten minutes remaining Slattery’s shot brought out a fine save from Strain. Then the Roy had a strong claim for a penalty kick for handling in the box but referee Scott ignored the pleas. In the dying embers of the match substitute Jamie Whyte should have added to the Buffs’ tally but fired past the post when through on goal. Despite all their efforts the Roy were unable to break down a resolute Kilwinning defence and the home side eased to their third home win in a row. Sponsor Malcolm Campbell presented the Supporters’ Man of the Match trophy, kindly donated by Roddy the Dog Walker, at the end of the game to Craig Gordon. The defeat leaves Stewart Maxwell’s side 11th in the table with 19 points from 17 games, having won four, drawn seven and lost six of their games so far. Rob Roy: Gordon, Capuano (Vezza), Clark, McBride Daly, Ramage, Gallacher. Slattery, Hughes (Carroll), Currie-McLean, Mackie (Sawyers). Next up for Rabs is a home match with third-bottom Kilbirnie Ladeside this Saturday, January 5. Kick-off at Guy’s Meadow is 1.45pm.